4 burger buns – brioche buns work too. Use best quality available soft fresh buns. 4 slices of your favorite cheese – American, Cheddar, Mozerella, Provolone, etc. Preheat your oven or toaster. Make a batter by combining the flour, sea salt and baking powder and mix well then add the beer and egg to the mixture and mix well again. Place all of the halibut into the batter. Set aside. Prepare the vegetables by washing the lettuce, and slicing the onion and tomato. Set aside. Combine the juice, mayo and relish to make a sauce for the burgers. Set aside. Using an oven or a toaster, warm up the buns until just toasted and melt the cheese on them. Add the 4 Tbs oil to a skillet and cook using medium to high heat until 350 degrees or just hot enough to fry without smoking. Remove the buns from the oven and set aside onto plates. Add the battered halibut to the hot skillet. Flipping once, cook the halibut for two and a half minutes on each side until batter is golden. 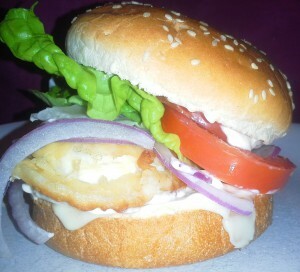 Place cooked halibut directly onto each cheese topped bun; there will be approximate two pieces per serving. Add the sauce to the naked side of the bun and top the halibut with the vegetables. You can serve these burgers open face and allow everyone to fold over their own burger. This is a satisfying burger and I avoid serving too much with it. Some ideas for a complimentary side dish may include cucumber salad, pickled cabbage, kimchi, beet salad and pickled beets with onions, garlic and beet leaves. This dish is especially deliciously convenient if you have an appointment after dinner because it is satisfying without being over filling and it doesn’t take long to eat or prepare. Another great characteristic of this recipe is that is can be easily assembled hours after it has been cooked. Just warm the halibut and the buns on a baking tray in the oven or toaster and assemble as directed above.